Bougainville (capacity of just 184 passengers). Beyond the environmental footprint, the placement of larger cruise vessels in markets such as the Galapagos, actually can do passengers a disservice. 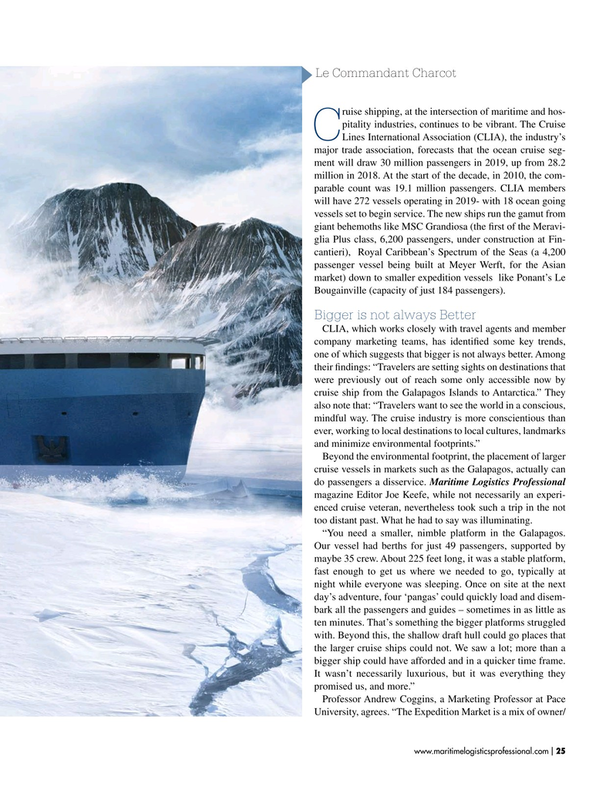 Maritime Logistics Professional magazine Editor Joe Keefe, while not necessarily an experi- enced cruise veteran, nevertheless took such a trip in the not too distant past. What he had to say was illuminating. “You need a smaller, nimble platform in the Galapagos. Our vessel had berths for just 49 passengers, supported by maybe 35 crew. About 225 feet long, it was a stable platform, fast enough to get us where we needed to go, typically at night while everyone was sleeping. Once on site at the next day’s adventure, four ‘pangas’ could quickly load and disem- bark all the passengers and guides – sometimes in as little as ten minutes. That’s something the bigger platforms struggled with. Beyond this, the shallow draft hull could go places that the larger cruise ships could not. We saw a lot; more than a bigger ship could have afforded and in a quicker time frame.